Trying something new in 2017? Thank you to the Team Captains for your motivation, encouragement, organization skills and support throughout the Summer Season. 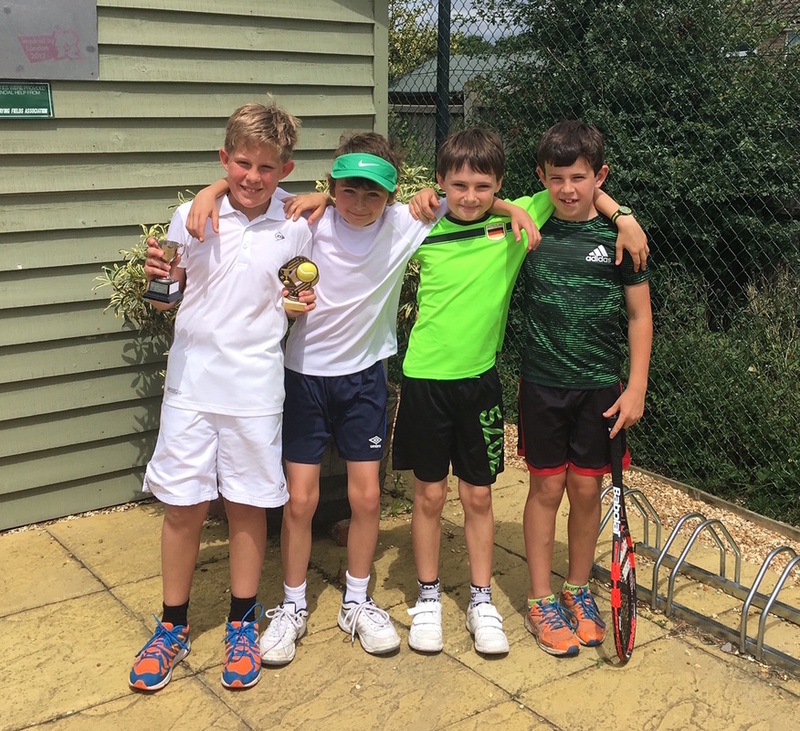 Wrecclesham Tennis Club always put out their strongest teams whilst encouraging and supporting new team members offering match play opportunities wherever possible. We continue to be regarded as the friendly local club, enjoying our game, rejoicing in our victories and 'coming second' with good grace. Well done to all of you! The Ladies A team had a good season finishing top of Division 2, 46 points ahead of Bourne A who finished 2nd. Ladies B were 7th in Division 2 so will go down to Division 3. Ladies C did well and finished 2nd in Division 3 so will be going up, therefore, the B & C team will be in the same division. The Mixed A team finished top of Division 2 and will go up to Division 1, which may be challenging but they are up for the fight. The Mixed B team finished 7th in Division 3 so they will go down to Division 4; it was quite a tough league. The Men’s A team did exceptionally well to initially finish 4th out of 7, at that point being safe from relegation with two matches to play. They finished the season on a high beating the previously undefeated division winners Elstead A in the last game of the season. Unfortunately, due to post season adjustments relating to Camberley B being scrubbed having failed to put out a team on 3 occasions, the A team finished 5th. Fingers crossed that they are still safe from relegation. The Men’s B team did equally well to finish 5th of 8 in their division, especially with strong David Lloyd and Aldershot TC teams in their league. Four Ladies’ teams, two Mixed teams and three Men's teams are in the ADLTA Winter League 2016 -2017. Hopefully all team members are in good shape going into the winter season! Gemma completed her tennis management Degree and has now been accepted on to the honours programme. The Committee have congratulated her on this achievement, please do the same when you see her. Thank you Gemma, for all your excellent work in providing such an array of coaching opportunities. This has definitely helped to enhance the club’s status in the community. The LTA approached Gemma to become a ‘Cluster Organiser’ for their new product “Team Challenge”. This is a Davis Cup format but without ratings so recreation and pre-competition minis/juniors can take part. Sadly, we say goodbye to William Wheeler as he takes on a new challenge to further develop his coaching career. If we had known, we could have said goodbye properly but we wish him all the best for the future. We have a new addition to the coaching team; Ian Bicknell, who is a Level 4 coach, will be primarily based at Ash but available at Wrecclesham on Tuesdays and for private lessons. James Allan is starting his Level 2 in September. Our recent Ladies’ Charity Tournament was a big success. 16 ladies battled it out with the eventual winners being Diane Pettitt and Sue Ridgers. A cheque for £101 was sent to Cancer Research UK. We aim to build on this next year with events for adults and families. Membership remains steady. We now have 133 Adult/ student members, which includes 10 life members and 15 social members, who have joined to play with their children who are Under 12. This membership has been popular. We have 81 Junior members. There have been 20 new adult/student members, 5 new social members and 30 new junior members. The numbers are encouraging. The coaching has been popular and has attracted more families to join either as full members or social members. Brian Grieg continues to promote the club and has also introduced several of the new members. Many have been coming regularly to club sessions, getting to know us all and have improved their standard of play as a result, Get Out and Play. Promoting the club is extremely important. This year members supported two Open Days. Thanks to all the members, Committee and coaching staff who have also represented the club at The Wrecclesham Fete, St Peter’s School Fete and The Farnham Community Games. Health and Safety – Please inform a committee member if any injuries take place on court so that we can complete an incident log. The weeds are taking over! Please allow a little extra time to keep our club clean, tidy and weed free. 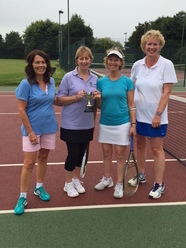 Sunday, 21st August the ladies of Wrecclesham Tennis Club held their annual Charity Tournament with 16 players taking part. Raising money for Cancer Research UK this year, Diane & Sue won the Charity tournament beating Dawn & last years Champion Kathy. Well done ladies. Congratulations to James Cooles for winning the 2016 Singles Ladder with a 6/2 6/3 against Jack Cousins in the final. Those wanting to challenge James for the title or just wanting some singles matches, please contact Simon Fabry. The ladder will kick off on 25th September. On a very hot Saturday 16th July the Junior Club Championships took place with 8 events. Lots of great matches played in the sunshine, gave the spectators lots of reasons to cheer and clap. Some new events compared to last year in action this time round and plenty of new champions as players move up age groups. Well done to Toby for defending his U16 Singles. 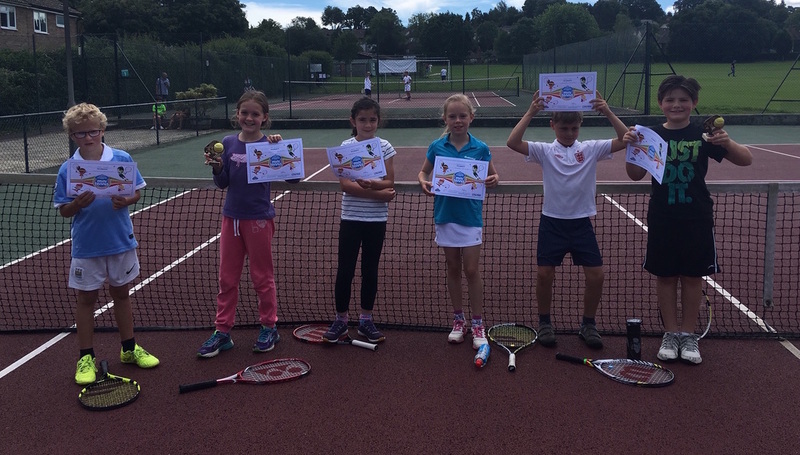 Thursday 9th June 2016 was a busy afternoon at the club with the Active Surrey Primary School Games. St Peters, St Polycarps and Rowledge each entered 2 teams (a team is made up of 2 girls & 2 boys). The schools were split into 2 round robin groups with play offs at the end to decide the champions, who were Rowledge A. Well done to Head Coach Gemma, Coach William and Assistant Coach James for running the tournament. 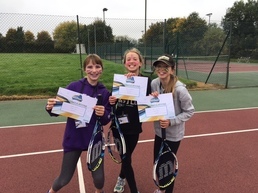 Following this the Wrecclesham Brownies brought 23 girls for their annual summer tennis session with Head Coach Gemma. The girls all took part in a giant game of "Bump", hitting volleys and forehands along with bounce and catch rallies. WELL DONE to LINDA TAYLOR and TONY FOULKES who won the tournament with the highest scores of 19 out of 24! 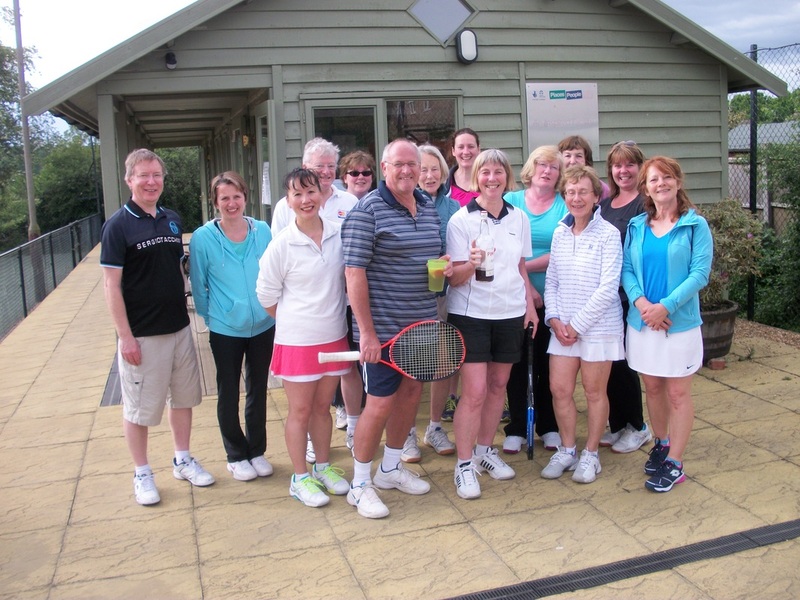 It was a lovely afternoon and the 14 players all had a great time, enjoying good tennis with Pimms and cake! 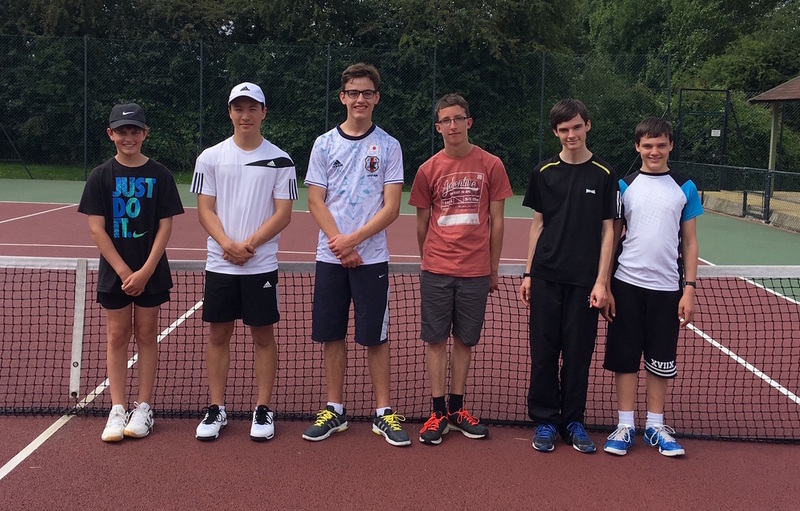 12 players aged 8 to 16 years old took to the courts on Saturday 14th May for the Terry Davis Cup. After 5 rounds of doubles, Archie & Jack were crowned our champions, scoring the most points. Once the doubles was concluded the juniors participated in 3 round robin singles boxes to really test their skills. Please see the details on the Membership page. An enjoyable evening in which 6 teams of 6-8 players joined our quiz evening this year. We all racked our brains trying to remember all the James Bond films and the years in which they were released. Thanks to Brian Greig our quizmaster for putting together the questions and leading the evening. Thanks also to Diane Pettitt and Shirley Cauldwell for organizing the event. Shirley's team's superior knowledge of those Bond films gained them the winners' prizes! 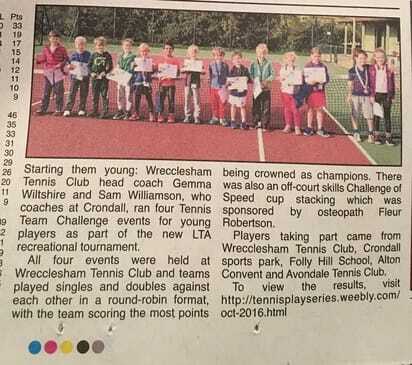 Well Done GEMMA - fantastic news for Wrecclesham and Ash Tennis Clubs! "In November last year we all witnessed the Aegon GB Davis Cup Team writing their names into history by winning the Davis Cup by BNP Paribas for the first time in 79 years. The Davis Cup Legacy is about inspiring the next generation to pick up a racket and 2016 will give thousands of new children the opportunity to play tennis for free."